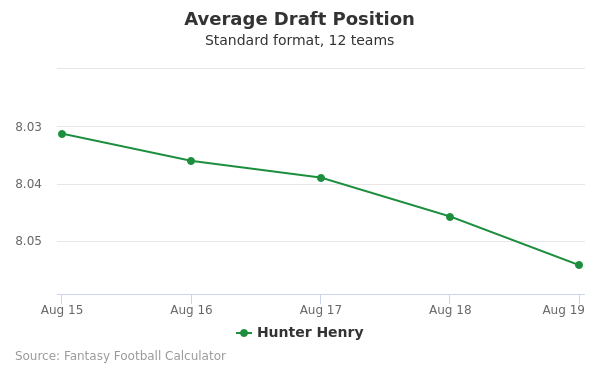 Hunter Henry's fantasy value is measured by his average draft position (ADP) in fantasy football mock drafts. 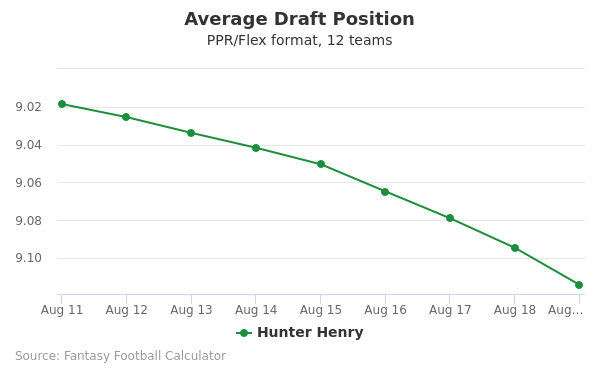 In recent drafts, Henry's current ADP is 6.05, which indicates that his fantasy outlook is to be the 5th pick of the 6th round, and 65th selection overall. 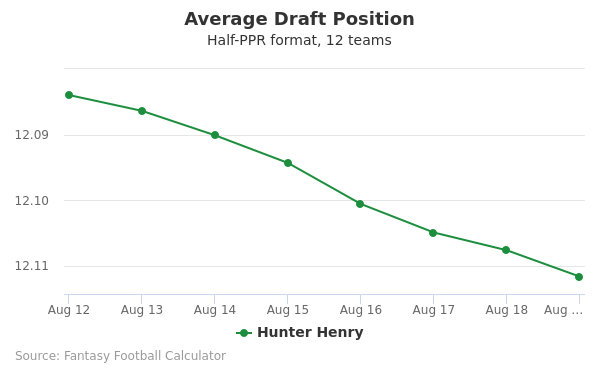 The code below will display a graph that updates every day to show the ADP data for Hunter Henry for the past 30 days in 12-team PPR leagues. Draft Hunter Henry or Lamar Miller? Draft Doug Baldwin or Hunter Henry? Draft Hunter Henry or Jordan Howard? Draft Hunter Henry or Russell Wilson? Draft Hunter Henry or LeSean McCoy? Draft Hunter Henry or Tyler Lockett? Draft Drew Brees or Hunter Henry? Draft David Njoku or Hunter Henry? Draft D.J. Moore or Hunter Henry? Draft Hunter Henry or Sammy Watkins? Draft Hunter Henry or Rashaad Penny? Draft Corey Davis or Hunter Henry? Draft Hunter Henry or Robby Anderson? Draft Hunter Henry or Kareem Hunt? Draft Hunter Henry or Jerick McKinnon? Draft Hunter Henry or Vance McDonald? Draft Hunter Henry or Philip Rivers? Draft Hunter Henry or Matt Ryan? Draft Carson Wentz or Hunter Henry? Draft Hunter Henry or Peyton Barber? Draft Allen Robinson or Hunter Henry? Draft Chicago Defense or Hunter Henry? Draft Emmanuel Sanders or Hunter Henry? Draft Hunter Henry or Jared Goff? Draft Hunter Henry or Latavius Murray? Start Hunter Henry or Lamar Miller? Start Doug Baldwin or Hunter Henry? Start Hunter Henry or Jordan Howard? Start Hunter Henry or Russell Wilson? Start Hunter Henry or LeSean McCoy? Start Hunter Henry or Tyler Lockett? Start Drew Brees or Hunter Henry? Start David Njoku or Hunter Henry? Start D.J. Moore or Hunter Henry? Start Hunter Henry or Sammy Watkins? Start Hunter Henry or Rashaad Penny? Start Corey Davis or Hunter Henry? Start Hunter Henry or Robby Anderson? Start Hunter Henry or Kareem Hunt? 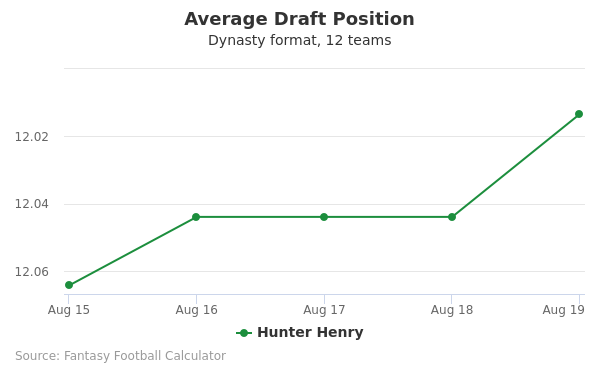 Start Hunter Henry or Jerick McKinnon? Start Hunter Henry or Vance McDonald? Start Hunter Henry or Philip Rivers? Start Hunter Henry or Matt Ryan? Start Carson Wentz or Hunter Henry? Start Hunter Henry or Peyton Barber? Start Allen Robinson or Hunter Henry? Start Chicago Defense or Hunter Henry? Start Emmanuel Sanders or Hunter Henry? Start Hunter Henry or Jared Goff? Start Hunter Henry or Latavius Murray? He was born in Little Rock Arkansas on December 7, 1994. His father played as a defensive lineman for the Arkansas Razorbacks during 1987 to 1991. Henry attended a private college prep school where he played for the Los Angles Chargers for four years. He began his sophomore year winning the state championship with the Bruins. Rivals.com ranked him the 2nd best tight end in the United States. During his senior year he made 1,449 passes and 15 touchdowns. His coach was Kevin Kelly. In college he attended the University of Arkansas where he played for the Arkansas Razorbacks. In 2015 he helped the team win the game against the Ole Miss Rebels from the University of Mississippi. His unique pass helped the team win the game and lead to a large amount of media coverage on this game. Henry won the John Mackey Award for the best tight end in the nation. During his four years at University of Arkansas he helped the Razorbacks beat their rival the Texas Longhorns in the 2014 Texas Bowl. He won many awards and trophies. In this video Hunter Henry receives the John Mackey Award. The 2016 NFL Draft took place in the Auditorium Theater in Chicago, IL from April 28 to the 30th. Henry Hunter was chosen by the San Diego Chargers during the second round of the draft. He was able to skip most of the drills at the NFL Combine. His ability to block other players was a big part of his success and as a player. He entered the NFL draft in his junior year after an outstanding year of playing on the team. He is considered one of the best tight ends in NFL Draft history. He was called a first round pick by an NFL scout. His strengths are he can catch, run and block. In 2015 Henry Hunter was a junior at Arkansas University. He excelled at football during his junior year. He finished second on his team with 51 catches for a distance of 739 yards, and scored 3 touchdowns. He earned first team All Sec Honors and entered the NFL Draft skipping his senior year at college. He was voted the number 2 recruit in the state. He was 6 foot 5 inches tall and weighed 253 pounds in his junior year. He received a very high draft evaluation rating from the NFL according to his coach Coach Bret Bielema. In 2016 he signed a four year contract with the San Diego Chargers for a salary of $3.98 million. He received a signing bonus of $2.84 million. He entered training camp and competed against Sean McGrath and Asante Cleveland two seasoned veterans. The team named him third tight end to begin a regular season. The second week he helped them win a game against the Jacksonville Jaguars. These are some of the highlights of his career. In his rookie season he scored the second most touchdowns of a player in the last decade. In this video are highlights of Hunter Henry's 2016 season. He was named Parade All American when he was a senior in high school. His parents were Mark and Jenny Henry. You can follow him on twitter. His 40 time range or yard dash is 4.68. His vertical jump is 31 1/2. These are statistics that show why he is a superior player.